A game of two halves - funky and bonkers - sometimes at once! Perfect for sonic adventurers. Small footprint. Multi-functional. Synth tracking is a bit glitchy. 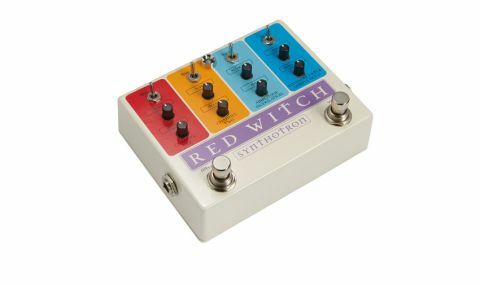 The Synthotron from New Zealand firm Red Witch has two different functions that can be used independently or together, each with its own footswitch. "The envelope filter is really cool for auto-wah and Mu-Tron-esque stuff"
The first is a twin-voice analogue synth, and the second an envelope filter that's really cool for auto-wah and Mu-Tron-esque stuff, but can also function as a sample-and-hold generator. The synth (oscillator triggered by signal to voltage conversion) offers two channels, each with level, decay and a choice of octaves (unison, or one octave up and one or two octaves down). It's monophonic, and tracks best further up the neck (anything below the 9th fret can be glitchy): it's probably best used mixed with some dry sound for solidity. You can also apply tremolo with variable speed. Synth and filter together is a recipe for sonic madness. Not everyone wants analogue synth sounds from their guitar, but the Synthotron offers it in a small footprint with bonus funky-filter action.